Quick Definition: The multiplier effect is when an increase in government spending has a greater impact on the economy than the initial amount spent. The multiplier effect is a concept in economics that describes how an injection into an economy, such as an increase in government spending, creates a ripple effect which increases employment and the output of goods and services in the economy. An injection occurs in the economy, such as an increase in government spending. 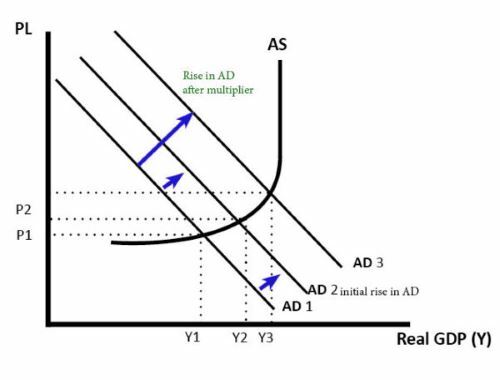 The injection increases the aggregate demand in the economy for goods and services. The increase in demand for goods and services causes firms to employ more workers and expand output. As firms are employing more workers, more people have disposable incomes and subsequently the aggregate demand increases in the economy. 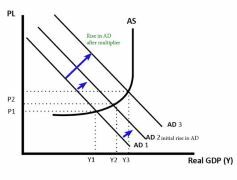 The increases in aggregate demand causes firms to employ more workers and the effect continues as before.